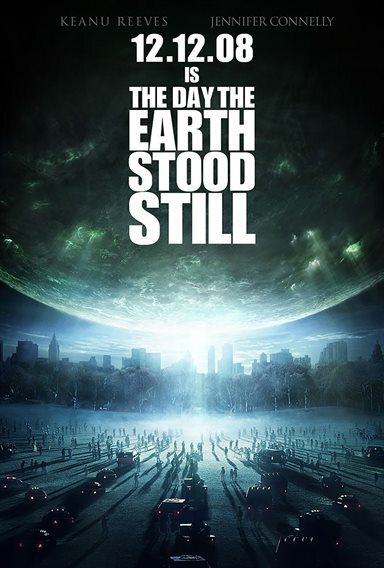 Download The Day the Earth Stood Still in Digital HD from the iTunes store. The Day the Earth Stood Still images are © 20th Century Fox. All Rights Reserved. When making a remake there are usually a few options. From what I understand, Gus Van Sant's, Psycho, was almost shot-for-shot. We have also seen general updates (Ocean's 11 or The Italian Job) where a classic is re-imagined for a more modern context. We have seen The Hulk's 'reboot', where the opening of a franchise is simply given a "do-over." There are re-imaginings (The War of the Worlds) where different directors have entirely different visions for the same idea. When this happens we are not just invited; but demanded to ask why? Why remake this movie? Is it timeless, and a refresh will make it more palatable to modern audiences? Was the original timely, but there is a current message that can be brought out? Was there some potential in the original that was missed…or was the original so popular that there is a quick dollar to be made off name-recognition? 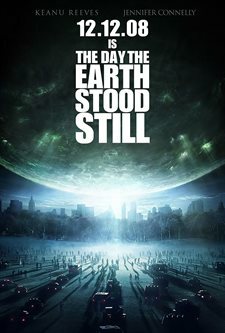 From what I can tell, Scott Derrickson's, The Day The Earth Stood Still (TDTESS), is an honest attempt at the making of a relevant update for a well-loved movie. The 1951 original was a cold-war cautionary tale. A tale where a space-faring group of civilizations gives us our final warning about the dangers of atomic power. When the space-man (Klaatu, played in 1951 by Michael Rennie) can't get our attention, he puts the earth in "time out"; at that time (1951), kids were not put in 'time out' -- even in liberal families like those of the filmmakers; he also shuts down all power not necessary to sustain human life. When that doesn't work, he gets shot, dies, resurrects, and makes it to his space ship. He warns lots of scientists to 'get it together--or else' before taking off. The problem then was nuclear war! Today it is environmental destruction: we are killing the planet, and rather than let that happen, the space-people will, um, genocide us. Way to go, enlightened space-people! As an artifact of film, TDTESS passes the first bar that any visitor-from-space movie must pass with flying colors. After a too-long, somewhat dull opening sequence in the Himalayas, it takes us to modern day America where scientists are being gathered for something catastrophic. Here the movie must impress us with its sense of scale and grandeur of the human's response, and then top that with the arrival of the aliens. In TDTESS we see football fields full of choppers, teams of scientists expertly snatched from their homes, throngs of VIPs as in-the-dark as we are (well, we bought the tickets so we're ahead of them). It gives us a mercifully short, punchy briefing and then takes us to the pay-off where we get to see the first "really big" special effect. I was impressed with everything other than the airborne choppers near, what would hypothetically, be a death-zone. No thinking response team would put a fragile flying response team in the blast zone. The tension, including a great touch where the main character, biological scientist Helen Benson (Jennifer Connelly), smuggles in a cell phone to call her son when she thinks it is the last time she will talk to him. When caught by a cameo-suited guard in the ladies room, the guard, tearfully asks if she can borrow the phone rather than confiscating it. That's the beginning. When space-man Klaatu (here played by human-space-man Keanu) arrives, things start moving. Sluggishly. The movie has to shift gears from the opening shock-and-awe special effects to the characterization and plotting of the potential end of the human race. The space-people are now interested in saving the planet rather than, necessarily, us. The fact that Klaatu advertises himself as a "friend to the earth" leads to an "it's a cookbook!" moment that not only we--but supposedly smart Dr. Benton--should see coming miles away. The problem with the rest of the movie is not that it's preachy, although it is similar to everything environmental these days. The problem isn't with the acting (Reeves makes a very good Klaatu). The problem is that it is a slow, somewhat soggy chase scene where Klaatu is running from the government, aided by Dr. Benton (with her adopted son Jacob (Jaden Smith) in tow; presumably because the original had a little boy who lost is father in the war and helps convince the space-man that we are worth saving. The objective of Klaatu's chase not only doesn't make much sense, but he contacts someone who should have been able to do his job a long time ago, and do the aliens not have radio? Then he goes to a generic swamp to finish the job of shutting down the earth. The structure of the plot makes the moral heroine of the story, Dr. Benton, a stooge for helping him without asking the proper questions. Even worse, the American government is required to be obstinate and secretive and nasty in all the wrong ways. This might be a referendum on the Bush administration, but being released after Nov 5, it has a tin-ear for the zeitgeist. We never even see the president; he is stuffed in a mountain somewhere. Instead we get official busy-body Regina Jackson, Kathy Bates, making all of the obviously wrong decisions (such as shutting other nations out -- why?). She even plans to chemically interrogate the space-man -- apparently assuming that he (a) does not have any space-man friends, and (b) has absolutely no precautions of any kind against human-scale violence (despite having a hundred foot-tall attack-dog robot that he barely shut down after being accidentally shot). While Obama might not be the political super-star, I think a lot of voters (including this one) hope he will be the movie's lack of any American president; opting instead for a military-intelligence complex that just seems to take over and be pretty banal and stupidly hits all the wrong notes. Dr. Benson's son is supposed to be unhappily and missing his father – now dead; but until the end, there is almost zero chemistry between he, and well, anyone else. We assume his adopted mother must love him; but as the whiny little ingrate tries over and over to get the earth killed off because he has got too much angst to be agreeable, we start to wonder if maybe starting over with something like the honey bees might not be better after all. Finally, the end-scenes of coming apocalypse are incredibly well done; I don't know if the general populace knows what a "nano-swarm" is (a term not typically used in the movies) -- but it is a good alien super-weapon; and it looks and acts right. However, these too beg a question -- if the aliens are that powerful and willing to exterminate us, why don't they do things like share ? Could it be fusion power? Clean coal? Alien-space-batteries --with us? They can literally destroy a city and leave the trees standing. Why not just do that - Eradicate everything that isn't a Prius? TDTESS isn't a complete failure; the military parts are done well enough that I think most people that are looking for their hardware-fix will get their money's worth. 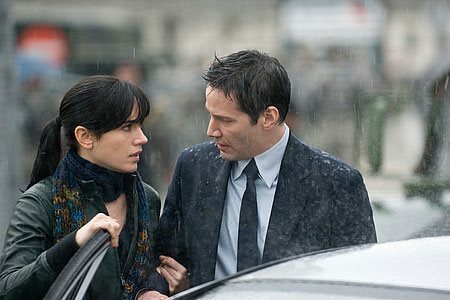 Keanu and Connely do well together when we aren't wishing she'd be less credulous; and, worse, she can be completely trusting because she is the "moral hero", and we know the movie is a "moral tale" – thus, she gets away with aiding and abetting someone who, in the story, is about to pull the plug on she and her kid -- without being a sucker in the terms the movie sees her in; but she is still a sucker! The F/X are great --the movie looks good. Would I recommend it? If you're willing to pay the ticket for the special effects or really love Reeves, go ahead and see it on the big screen. If not, I would, at best, wait for DVD. The Day the Earth Stood Still images © 20th Century Fox. All Rights Reserved.